This quote by Martin Luther King, Jr. is as relevant today as it was in the 1960's. In addition to our still salient divisions on the basis of color and ethnicity, we have increased partisanship, polarization, and what others may describe as "tribalism" in this country. Polls have shown increased partisan antipathy, meaning a higher percentage of both Republicans and Democrats view the other side unfavorably and even dangerous. The night before a man walked up to a GOP charity baseball practice to kill on the basis of a difference of opinions, policies, and methods, I discussed with my six year old son the corrosive nature of hatred, and the need to forgive in place of seeking revenge. He was finding it difficult to let go of perceived slights by others. In both cases I gave him either an innocent reason behind the actions he was angry about or explained to him that his perception may be wrong in the first place, in that perhaps the wrong did not occur to begin with. 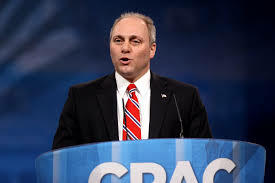 At this time the motive or madness of the man that shot and injured Republican representative Scalise, among others is still being determined, but I think it is safe to say that his actions were at least in part driven by hatred and a perception of threat. We scoff at his actions but we are not immune to those same feelings of hate and sense of danger, which for those without mental or emotional guardrails, serve as a rationale for violent actions. For most of us we have moral, psychological, or mental barriers to carrying out our feelings of hatred, but we all have, nonetheless, hate in our hearts at times. While this man's violent actions differentiate him from most, his hate is the same hatred that caused a young man to walk into a church in Charleston, South Carolina and kill nine innocent African Americans solely because of their race. It is hate bestowed upon an entire group simply because of a shared characteristic, and perception that this group is dangerous that prompted a group of young men to kill Mathew Sheppard, a young gay man. It is the same hatred and perception of threat that, in 2016, led a man in Dallas to ambush and kill five police, thus assigning them collective guilt for maltreatment of blacks; and the same hatred that led a man to carry out the desires of too large a number of people by assassinating Martin Luther King, Jr.
To then take the actions of the GOP baseball shooter and ascribe that mindset to Democrats, or to assign blame to them collectively is not very different from the equally misguided act of blaming all police officers for any unjust killings of young black men, or implicating all whites, in general and through stereotyping, in the killings of those 9 churchgoers in Charleston through. Already, the hatred exemplified by this man is corroding the hearts of others that use his actions as a reason to generalize about and hate an entire group of people that may share his party affiliation. The scary thing is, most of us are guilty of generalizing or harboring feelings of hatred in some degree or fashion against those that we perceive as different, unworthy, wrong, or a threat to desired norms, ideas, or standards. If Democrats are guilty of encouraging violence, unwittingly or not; then Republicans must carry responsibility for the threats to President Obama, none of which, fortunately, were carried out. And these expectations would be no different than those placed on millions of Muslims to somehow publicly disavow Islamic extremism or violence in the name of Islam. But none of us can live up to this expectation to accept collective responsibility, nor should we because it is undeserving. Any proclamations that an entire group, is indirectly responsible for violence against a member of another because of their language or actions that, in no court of law would ever be perceived as encouraging imminent lawless action, are misguided and only serve to promote the hate they are railing against. Labels that demonize a group, either preceding an act of violence or following one, must be discouraged everywhere and in any way they can be. Assigning negative characteristics, such as racist, immoral, dangerous, or unpatriotic to a large group collectively is a method used by the most abhorrent leaders in our history and even current perpetrators of terrorism in order to dehumanize a group and support the contention of that group as the "enemy". As individuals, though, we can attempt to check our anger and our hate by recognizing the humanity of those we disagree with, and trying hard to find an innocent, unavoidable, legitimate, or non nefarious explanation or reason for their views, characteristics, or behavior. In fact, politics and the legal system are venues for doing so; to decide disputes and to assign benefits or justice among members of a society. Therefore, we should not stop disagreeing or criticizing, but simply as individuals try harder everyday to check our own hatred and perceptions, and to not light fires of rage or give fuel to them. To do this, we must continuously remind ourselves of the humanity and difference of perspectives of others, allowing the same benefit of the doubt that we expect for ourselves. This is a bit easier, if we take the time to value exposure to alternative ideas and to educate ourselves about the perspective of those with differing opinions than our own.